Is there a term for the opposite of the greengrocer’s apostrophe? Is there a term for the tendency to omit the apostrophe in high-profile items where it would otherwise be expected? – such as “Student Manual” instead of “Student’s Manual” (and “Facilitator Guide” instead of “Facilitator’s Guide”)? This seems to be done in news items also, perhaps partly out of a tendency towards yellow journalism. For example, a recent news story in Yahoo! News had the lead, “Robert Kennedy son …”, instead of “Robert Kennedy’s son…”. The casual reader is pulled in by the expectation that the article is about Robert Kennedy himself. It could be argued that in some cases omitting the apostrophe is just fine. Each of the three cases below has a perfectly grammatical interpretation with the same meaning: there is a manual and it has to do with students. Note that the use of the genitive 's in (1) is not truly a possessive relationship anyway. Also, since the manual is intended for use by one or more students, the use of either the singular of plural of the attributive adjunct student in (2) and (3) could be well-motivated. So the Waterstones Apostrophe isn't as much of a problem as the Greengrocer's. This is probably why there is no commonly accepted name for it. Also found with "MENS". 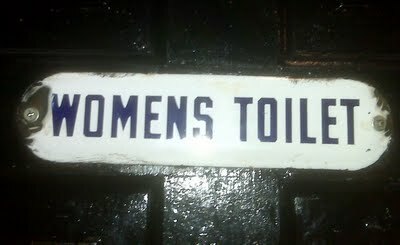 Of course neither MENS nor WOMENS is a proper word. So we might also call this the Restroom Apostrophe. Is “mens” a valid word? Young Surveyors Network or Young Surveyor Network? What is the term for words that can be used as the opposite of themselves? Term for homophones that have opposite meanings? Is there a term for an uplayable Solitaire hand? Is there a term for “-tive” and “-tative” word pairs ? Is there a word for opposite numbers? Is there a term for postponed prepositives? Is there a specific term for the use of adjectives?